We carry a wide variety of Imported Cheeses ranging from small blocks to wheels. We also carry an array of specialty crackers to compliment the cheese of your choice. We order in limited quantities to ensure the freshness and quality of all our Imported Cheeses. We encourage you to purchase what we have today, and try another tomorrow. Special orders are also accepted. 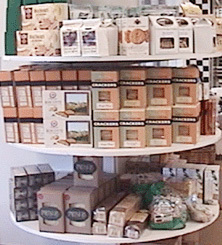 We carry a variety of crackers to suit every taste and occassion. Sauces and butter are located in our refrigerated area.